Can be early-spring sown (such as Witkiem which has green beans) or can be autumn-sown (such as Super Aquadulce which has white beans). Broad Beans do not need a rich soil. Sow on ground that has been manured for a previous crop. If sown on new ground, fork in some garden compost a month before planting. Change site each year for 3 years. Spring-sown Witkiem gives a high yield on deeply dug soil. If your soil is heavy, stick to spring-sowing. Sow seed in individual small pots in a greenhouse in late January or February. Cover with horticultural fleece or similar to stop mice from digging up and eating the seed. When the roots fill the pots, harden them off, plant outside and water in. Plant out in double rows at 23cm between plants, and 45-60cm between the double rows. Hand-weed the plants while they are small. Autumn-sown Super Aquadulce needs good drainage. Sow direct 5cm deep in late October to get good roots going which will support heavy yields the following year. The plants grow to 5-10cm and stay this size through the winter putting on side roots. Do not add fertiliser to the soil at the sowing stage, but add an organic fertiliser around the roots in the spring by hoeing it in. 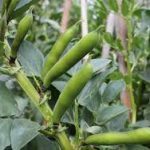 Broad Bean plants need support as they get large, leafy, and heavy with pods. Put canes or posts at 1.5m intervals down the sides of the double rows and tie string round them. Start when the plants are 45cm high. If the weather is dry when the plants are flowering and podding, give a really good watering at the roots to increase the yield. The tops of each plant can be nipped off once the plant is in full flower. Take off 12cm to get rid of any blackfly and to make the plant more sturdy. Harvest Pick young and tender. The scar on each bean seed when shelled should still be green. Be careful not to tear the pods away from the stem of the plant. Snip with scissors or twist outwards and downwards. Only a very short cooking time is required. After harvesting cut the whole plant just above soil level and compost it if it is healthy material. The roots can be dug in to benefit the following crop.